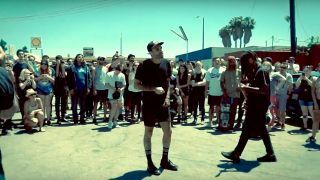 Former Letlive frontman Jason Aalon Butler has unveiled his new project called The Fever. He’s hooked up with ex The Chariot guitarist Stephen Harrison and Night Verses drummer Aric Improta in the outfit – and it’s Butler’s first work since Letlive announced they were splitting up in April this year. The band played several songs at Randy’s Donuts in Inglewood, California, yesterday afternoon – and footage of their debut performance can be seen below. Prior to the set, Butler said on Instagram: “To those of you who want change, here is an offering to start that conversation. I’ve had a lot of people asking me what I’ll be doing in the future – here is a taste of that. I love art. Announcing the end of Letlive, Butler, Loniel Robinson, Ryan Johnson and Jeff Sahyoun issued a statement saying that there would be “no further activity for the foreseeable future” and reported the reason was because there had been a “divergence in views and aims” within the band. Letlive released a total of four studio albums, their most recent being If I’m The Devil… which launched in the summer of 2016.